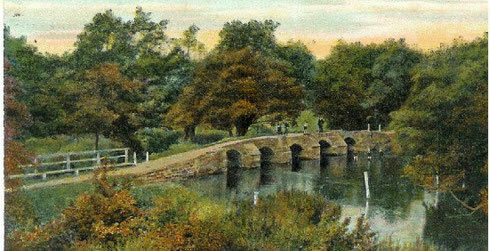 The history of Hampton-in-Arden can be traced back a very long way. It probably began when the Saxons founded a church and hamlet on a hill in the forest of Arden, near to the river Blythe. Hampton was certainly well established by 1086 when it was recorded in the Domesday book as Hantone, belonging to Geoffrey de La Guerche. This clearing in the forest was an isolated place, so very different to what it is today, being so close to the hub of the British transport network. Yet, remarkably, Hampton has retained its essentially rural character, despite its railway station and close proximity to Birmingham Airport and two of the busiest motorways in England. 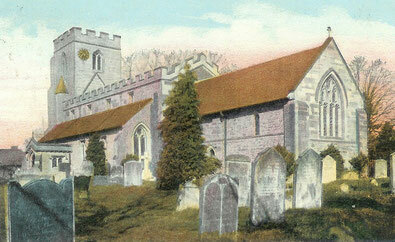 The church of St. Mary and St. Bartholomew, in part, dates back to 1130. This probably succeeded the wooden thatched building that was recorded in the Domesday Book. After the church, the most ancient surviving structure in the village is the 15th century packhorse bridge over the river Blythe, probably the earliest indication of how such a small a village could be so important to the commerce of the vicinity and ultimately a much wider area. Since the late 1830s this beautiful bridge has been overshadowed by the railway viaduct. The viaduct is not aesthetically pleasing, perhaps, but is a clear indication that Hampton has not stood still , and has most definitely moved with the times. 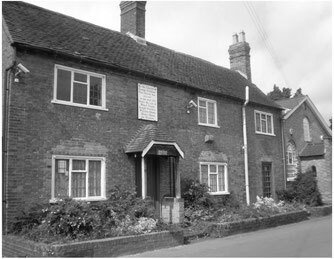 The earliest recording we have of a Manor House in the village dates from around 1276, during the early years of the reign of King Edward I. It had been built on the site of an earlier ruined castle, probably dating back to the reign of King Stephen. 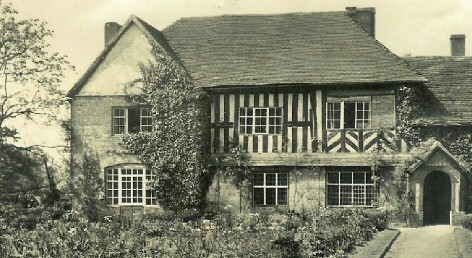 The present building, having been renamed the Moat House, dates from around 1588 and is privately owned. One of the names most closely associated with Hampton-in-Arden is George Fentham, a successful 17th century textile merchant who lived in the village. In his will he bequeathed an annuity of £30 to the village, £20 of which was to provide education to the local boys. The old school, built in 1782 still stands in what is now Fentham Road and was formerly Back Lane, and is now a private dwelling. A new school for boys was built almost directly opposite the old school in 1913. It opened its doors to the girls of the village in 1940 when their own school near the village green was given up for the war effort. Probably the most famous person associated with the village was Sir Robert Peel, Prime Minister and founder of the Metropolitan Police Force. He was Lord of the Manor for a while until his death in 1850. In his will he left £50 to the poor of Hampton. He was succeeded as Lord of the Manor by his son Frederick, who held the position for the next 56 years. 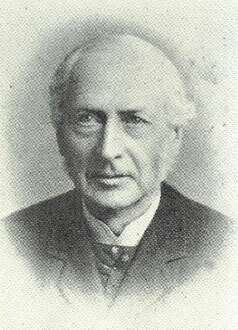 Frederick undertook his new duties with remarkable enthusiasm and energy, wasting no time in commissioning the building of a new manor house built by the eminent architect W. Eden Nesfield , who was also responsible for much of the distinctive architecture in the High Street. The railway came to Hampton in 1838 when the Birmingham and Derby Junction Railway Company opened a station in what is now Old Station Road. Queen Victoria stopped briefly at the old Hampton station in 1843 on her way to Chatsworth via Sir Robert Peel’s home at Drayton Manor. Whilst she waited to change trains she was presented with a red velvet scrolled map. 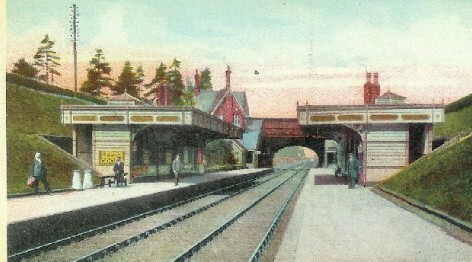 Part of the old station buildings still stand about half a mile down the line towards Birmingham from the new station opened in 1884. 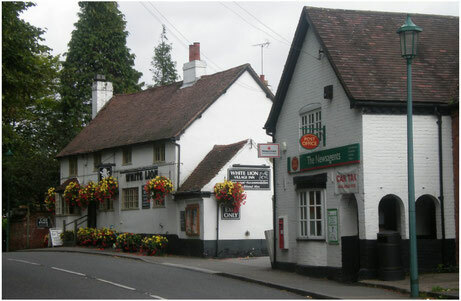 Today Hampton-in-Arden is a popular commuter village owing to its excellent position in relation to the West Midlands conurbation and the national transport network. It still, however, retains much of its rural character and is a delightful place to live and work.